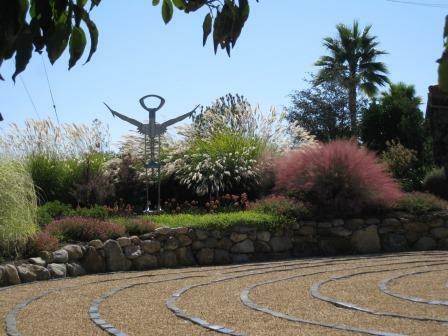 The Helms Sculpture Garden was designed as a stage for Fallbrook sculptor Jim Helms to display his and other artists’ works in a natural setting. The remodel transformed a barren hillside easement into a long linear gallery complete with dry stacked stone niches for art and plants. The pallet includes a mixture of grasses, trees, shrubs and succulents from Mediterranean regions around the world. A curvilinear driveway compliments the new borders. "Bacchus" by Wendell Perry stands watch over a 50' diameter labyrinth edged in black polished granite set in desert gravel framed by dry laid stone walls. Wildlife artist Don Rambadt's stylized owl "Bubo" formed the inspiration for the shape of the walls and bedlines surrounding his granite perch. An assortment of restios, grasses and other plants add movement color and texture throughout the year. This garden is a fusion of art, architecture and horticulture in the finest tradition of Landscape Architecture.